By traveling through the various rooms of our Webspace Mansion, you can study and investigate many relics and artifacts of the American Civil War period. These are both civilian and military items which were common at the time and indicitive of the American peoples’ true lifestyle. 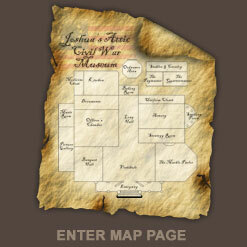 A smattering of rare items are also included for the more advanced historians and enthusiasts. But always there is a bit of wise and interesting information which accomanies the displayed items. When you access the Map Page, simply click upon the room that you wish to visit first. Each location contains items of a different typeand overall subject matter. When finished in that area, return to the Map Page to visit another room. After you have traveled through our historic domicile to your heart’s content, feel free to take the Self Test which has an answer-key supplied at its conclusion. A review of the rooms and their contents is listed below. Enjoy your visit, tell all your friends and please come see us again!!! Vestibule of Letters Letters from soldiers who returned and others who did not!